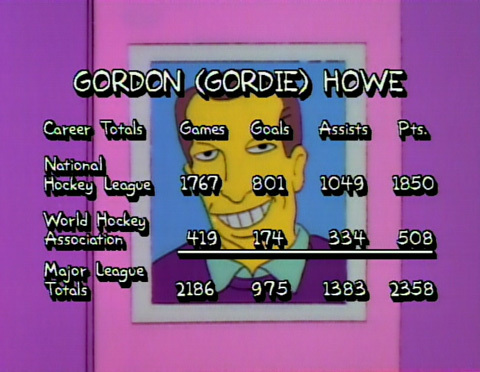 Simpsons, Eh? 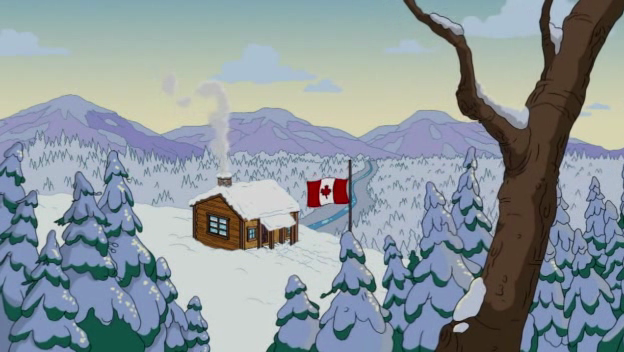 - Canadian Connections, "Marge anyone could miss Canada -- all tucked away down there"
A complete list of all the Canadian references ever to appear on the show. 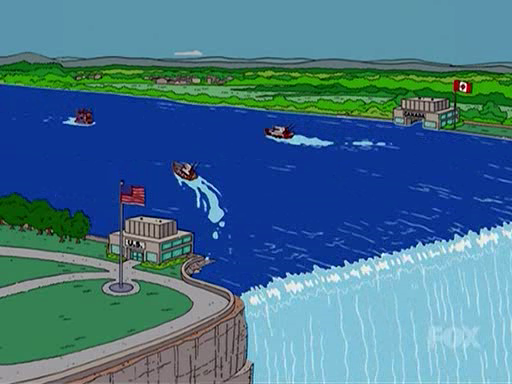 The Greatest Story Ever D'ohed (MABF10 / S21E16) - The Simpsons, on vacation in Israel, have a surly tour guide, "How about you experience a couple of genocides and see how laid back you are? We were purged from Spain - thrown out of there. They allow everybody in Spain. But for us Jews: no flamenco, get out. I'm pushy? Please. 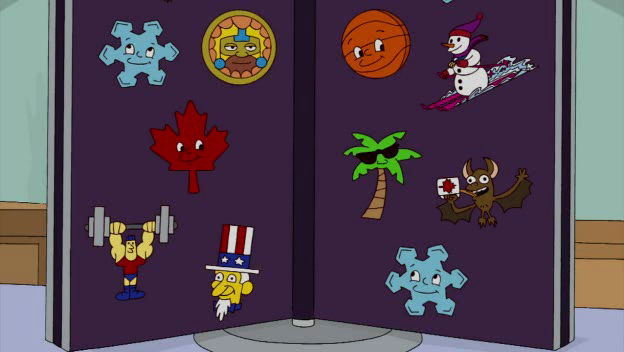 You, stay there, surrounded by your great enemy, Canada. Try Syria for two months, then we see who's pushy." 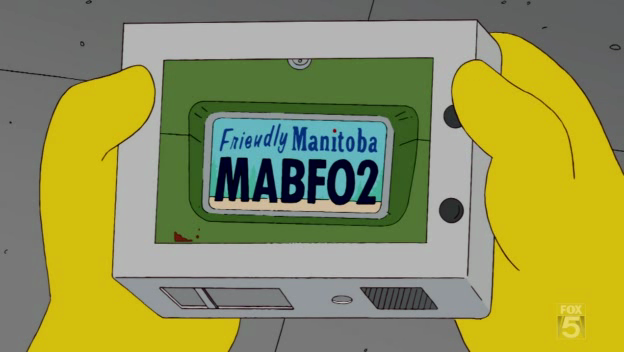 Thursdays with Abie (MABF02 / S21E09) - The Simpsons go to Wet 'N' Wacky World aquatic park, where Marge fills up her camera with photos of the parking including one of a Manitoba license plate. Eeny Teeny Maya Moe (LABF06 / S20E16) - At the start of the episode Homer is seen watching a very important "Mid-Atlantic hockey league conference, semi-final, do-over game". 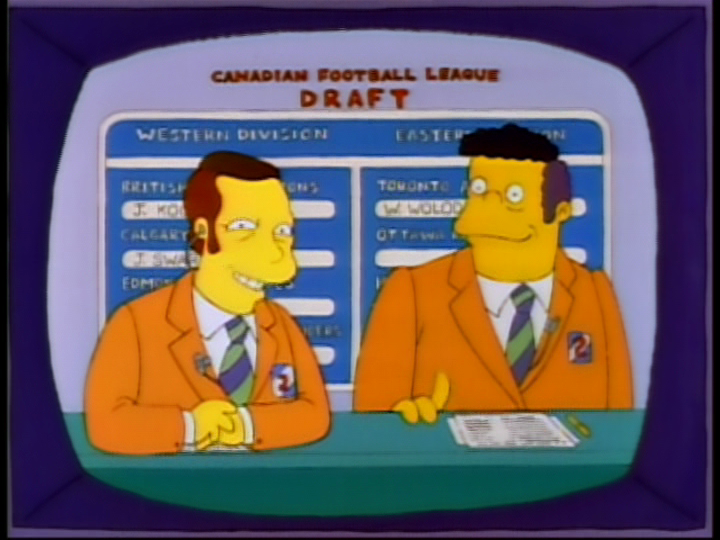 The play-by-play commentator of game sounds Canadian, and the studio commentators have the French-Canadian names Jean-Pierre Pétomane and Doc Jacques Lalonde. 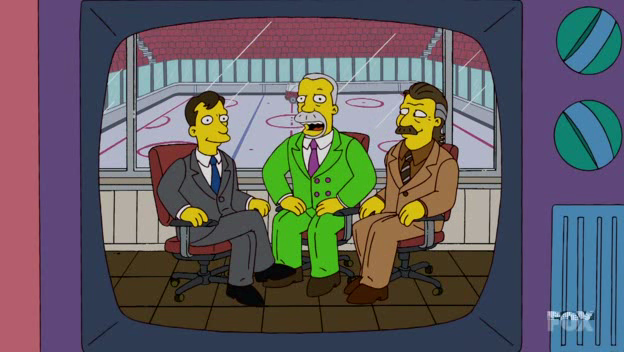 Jean-Piere looks like Don Cherry (oh the irony), while the third commentator, Wayne Bockhorn, looks like Barry Melrose. The Debarted (KABF06 / S19E13) - The Simpsons, whose car is damaged in an accident, get a brand new car as a loaner from the mechanic. After using the cars on-board feature to contribute directly to NPR, Lisa comments, "I never dreamed an American car, designed in Germany, assembled in Mexico, from parts made in Canada could be so amazing." 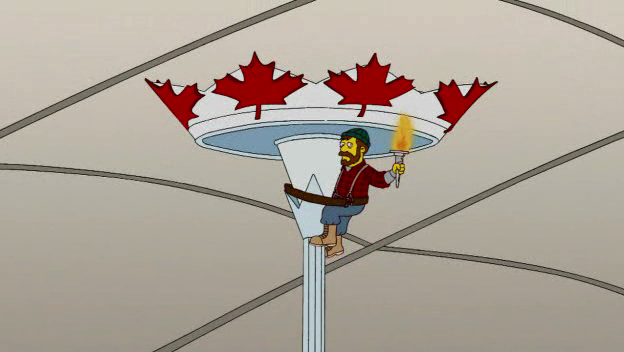 He Loves to Fly and He D'ohs (JABF20 / S19E01) - Burns flys Homer on his private to jet to the Chicago, "The Miami of Canada". 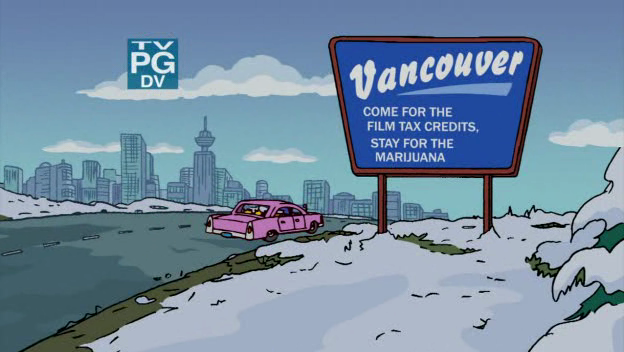 The Simpsons Movie - To get to Alaska by truck, the Simpsons must have driven through Canada. 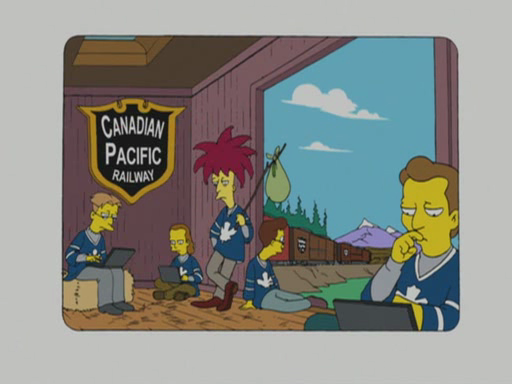 Also a leaf, that Homer used to write on, is a highly-stylized eleven-pointed maple leaf whose designed orginated with the Canadian flag. 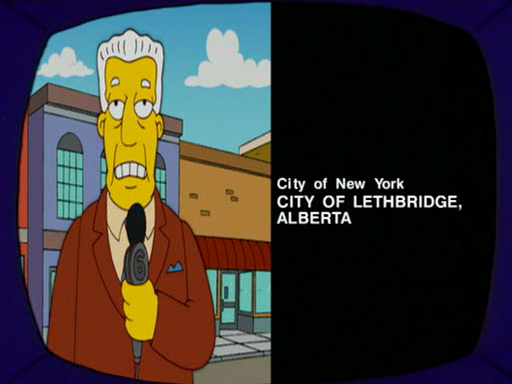 You Kent Always Say What You Want (JABF15 / S18E22) - Ludia-Crest is angered that dental hygiene video he made for a one time showing in Canada was being shown at the Springfield dental clinic. 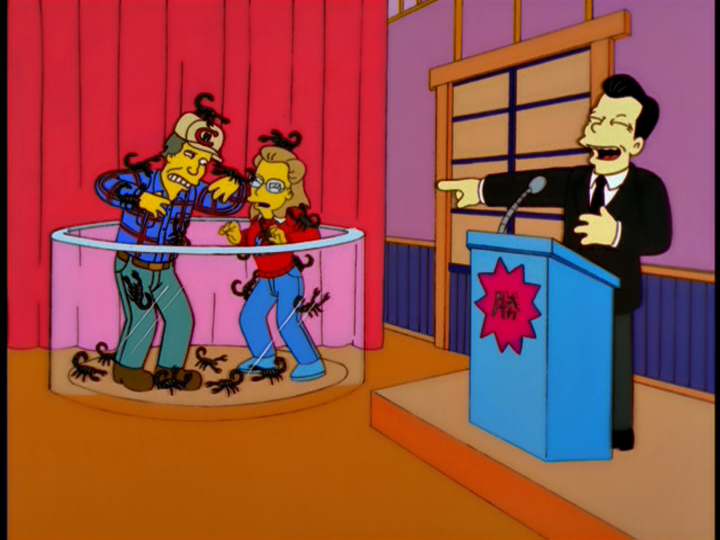 There's Something About Marrying (GABF04 / S16E10) - Homer becomes an ordained ministers to perform gay marriages. Homer giving the vows says, "And do you, Julio, take Thad to be your lawful wedded life partner, in Massachusetts and Vermont, maybe Canada, stay out of Texas, for as long as you both are gay?" 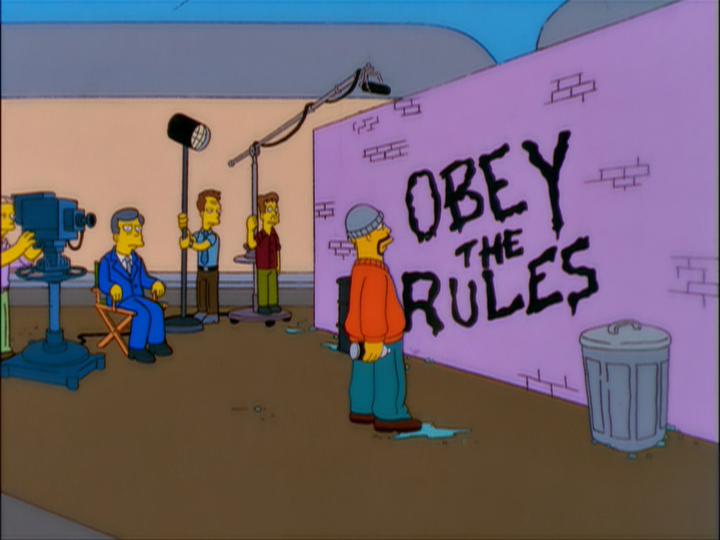 Bart-Mangled Banner (FABF17 / S15E21) - When Lisa speaks out about the 'climate of fear and repression' in the United States, the Simpsons are arrested under the Government Knows Best Act. They are sent to jail with a bunch of left wing celebrities, President Bill Clinton, and a man who drove a trucks full explosives from Canada, to which Marge wonders why they mix the real criminals with the joke ones. 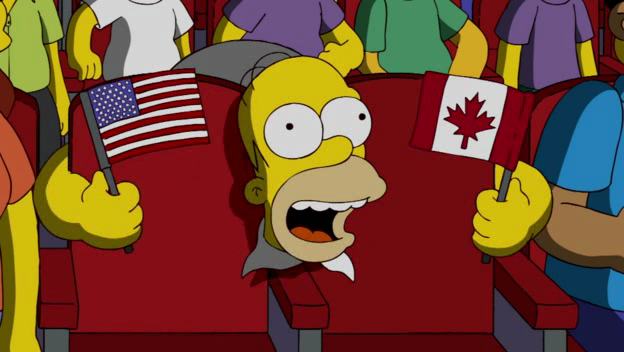 The Regina Monologues (EABF22 / S15E04) - Homer, who is talking to the Queen, makes the analogy of the United States being England's children, "I know we don't call as often as we should, and we aren't as well behaved as our good two shoes brother Canada, who by the way has never had a girlfriend... I'm just saying." 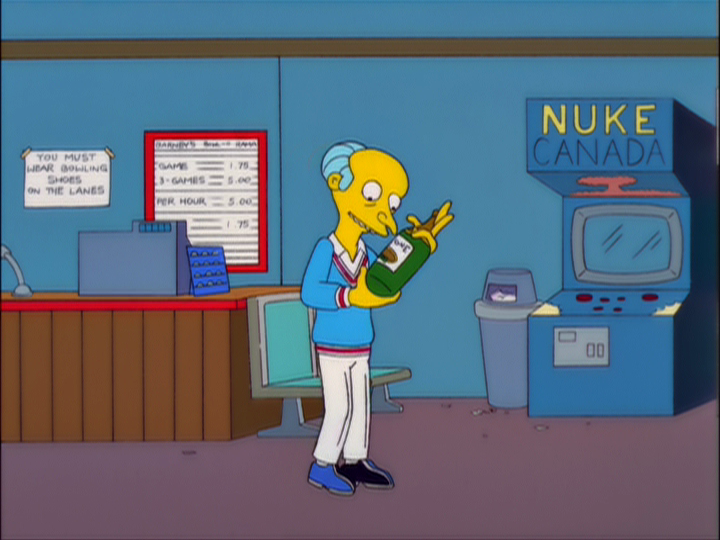 A Hunka Hunka Burns in Love (CABF18 / S13E04) - An arcade machine called "Nuke Canada" is seen in the bowling alley. Bye Bye Nerdie (CABF11 / S12E16) - Janey comments on the new girl in school, "Those shoes look Canadian." 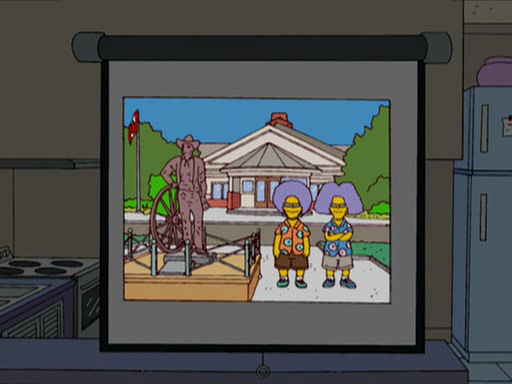 Skinner's Sense of Snow (CABF06 / S12E08) - The Simpsons watch the circus "Cirque de Puree". The pamphlet for the circus states: "As French-Canadians, they don't believe in refunds or exploiting animals for entertainment"; much to the disappointment of Homer. Saddlesore Galactica (BABF09 / S11E13) - Bachman Turner Overdrive are warming up to play and Bart asks Homer who they are. 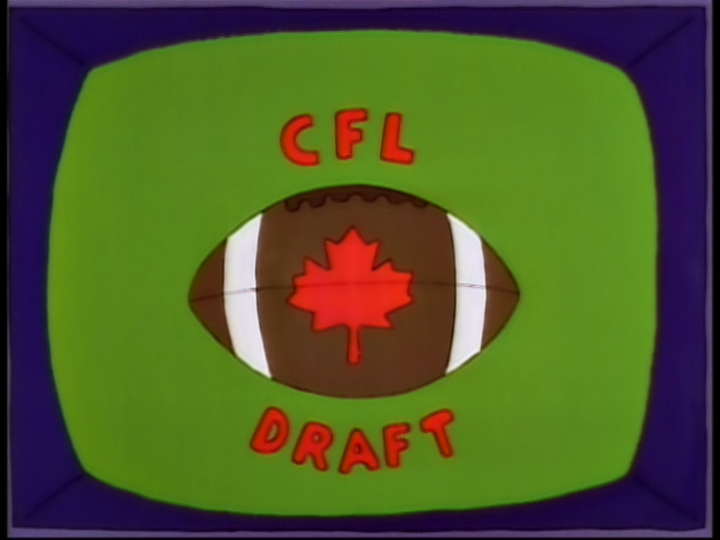 "It's BTO -- they're Canada's answer to ELP. Their big hit was TCB." 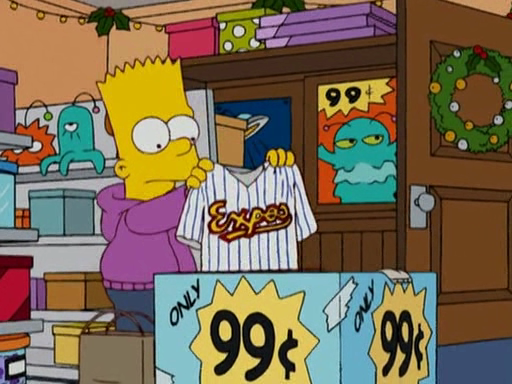 [notices Bart staring at him, questioningly] .... that's how we talked in the 70's. We didn't have a moment to spare." Homer to the Max (AABF09 / S10E13) - At a meeting of Springfield's elite President Clinton is rushed off after being told that Quebec has the bomb. 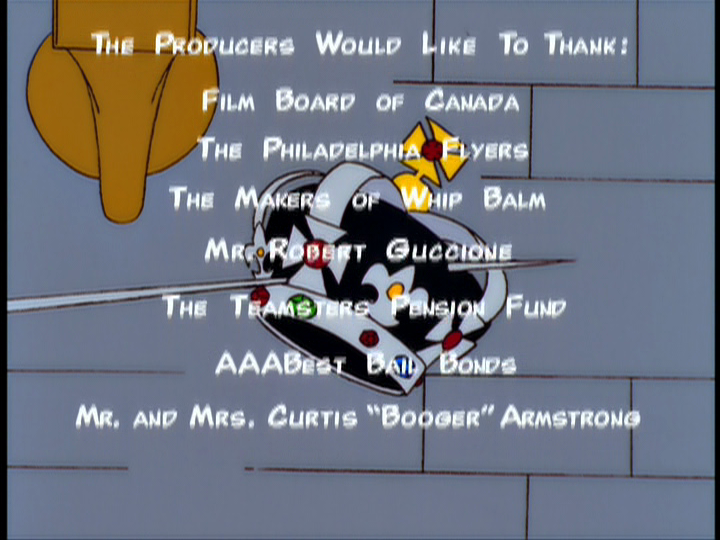 Lisa Gets an "A" (AABF03 / S10E07) - The Otto poses as a comptroller says at an assembly, "What she [Lisa] just did took courage, and where I come from, Canada, we reward courage." 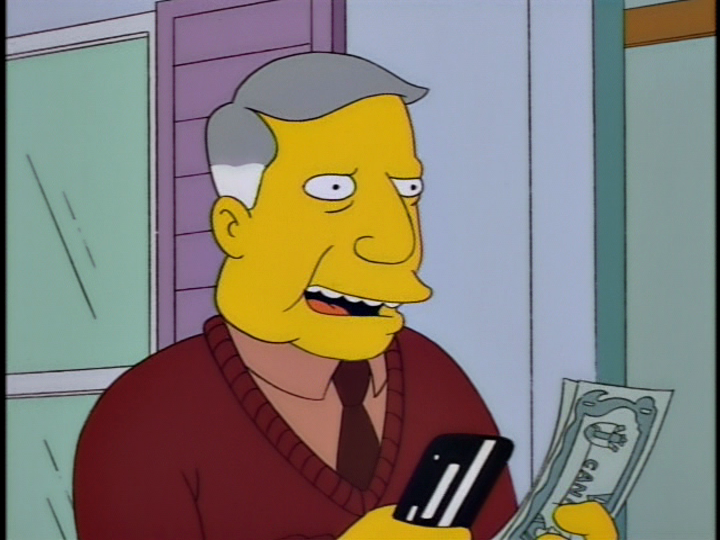 The Principal and the Pauper (4F23 / S09E02) - Principal Skinner gives Sergeant Skinner ten Canadian dollars he got as a souvenir he got from his trip to upstate New York. 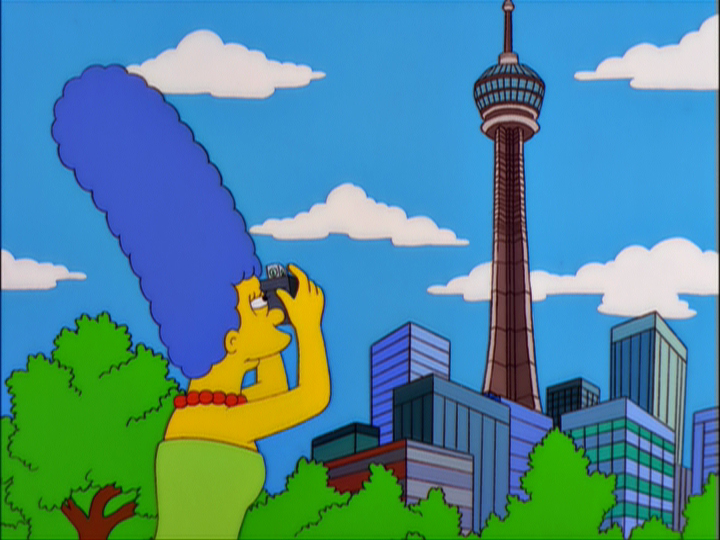 The City of New York vs. Homer Simpson (4F22 / S09E01) - Bart from the Statue of Liberty "Hey, immigrants! Beat It! Country's full! ", boat captain says "Okay, folks. You hear the lady. Back into the hold. 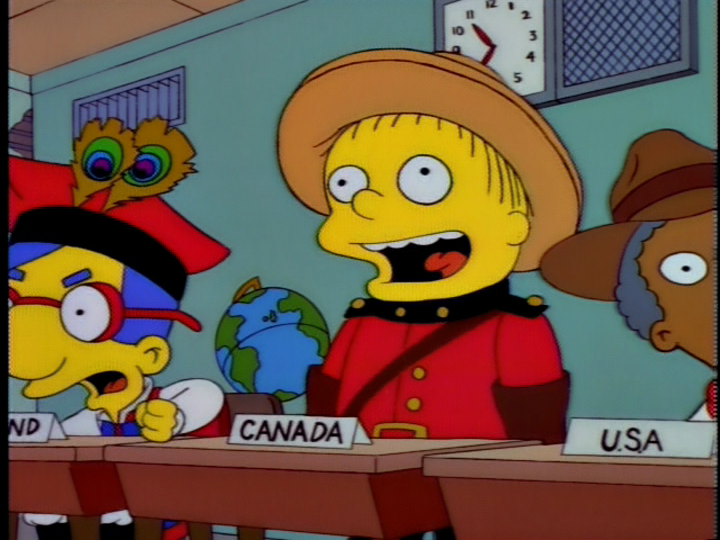 We'll try Canada." Followed by groaning of the immigrants. 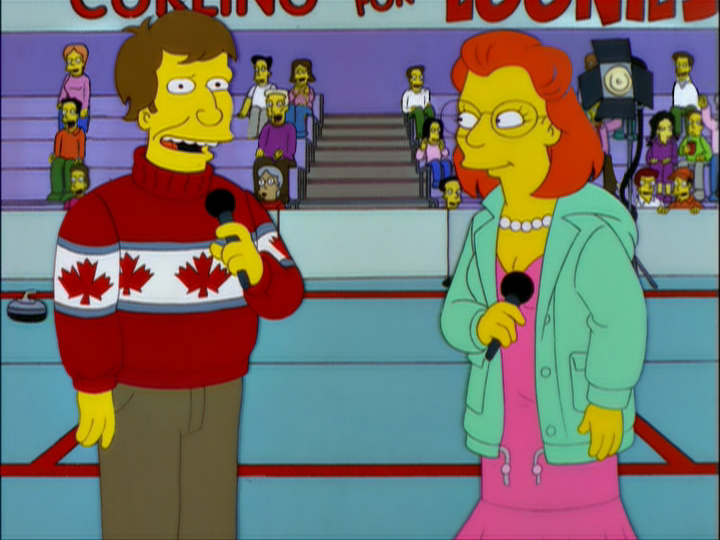 Burns, Baby Burns (4F05 / S08E04) - Homer is in a cider mill with Ned and Ned tells him that in Canada juice is cider and cider is juice. 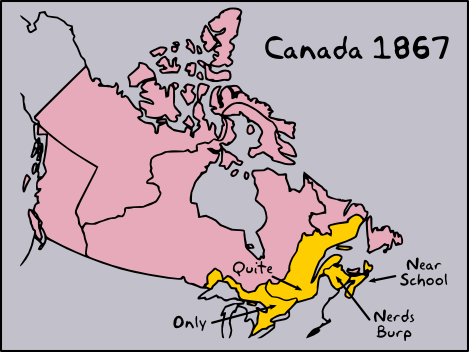 Not true by the way, just poking fun a Canada's "Oddball" ways. 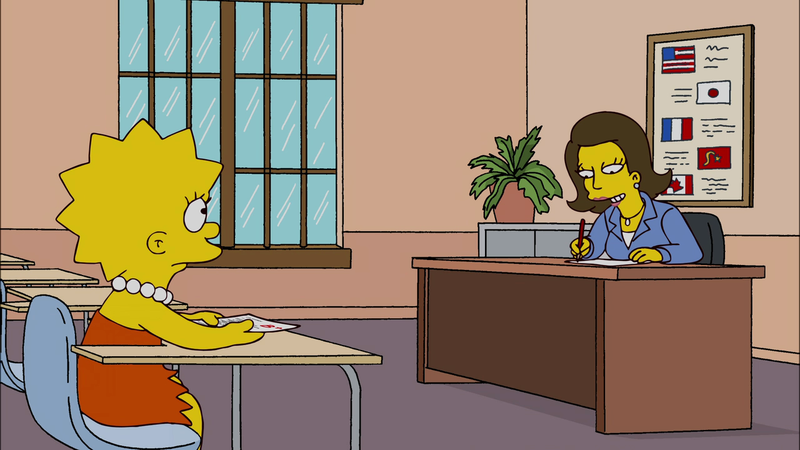 You Only Move Twice (3F23 / S08E02) - Bart is moved to a remedial class where he meets Gordy. 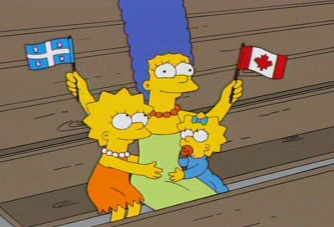 When Bart ask what he was in for he say "I moved here from Canada, and they think I am a little slow, eh?." 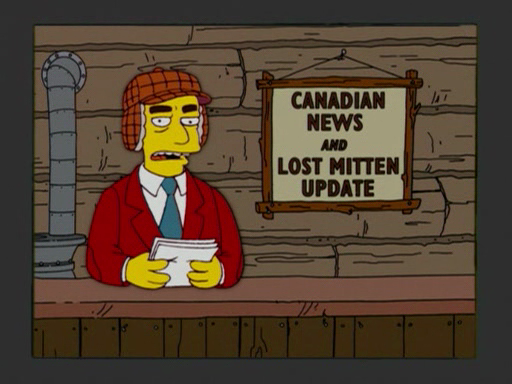 This little joke got the show's creator in trouble with some of his Canadian fans read more here. 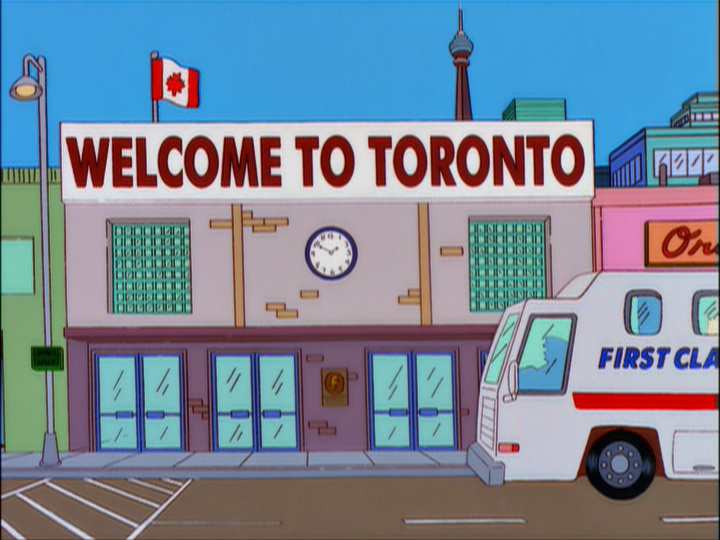 Bart, Milhouse, and Martin tell their parents they are staying at the Sheraton Hotel in Canada for a National Grammar Rodeo as a cover for their road trip. 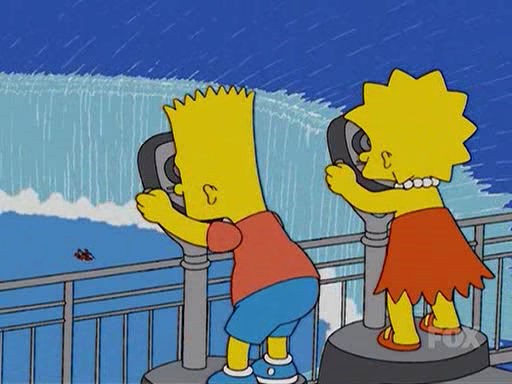 The father of a family of fighting kids threatens to turn around if they don't behave, Bart pulls up and Nelson hits the father in the back of the head. "That's it!" the father yells. 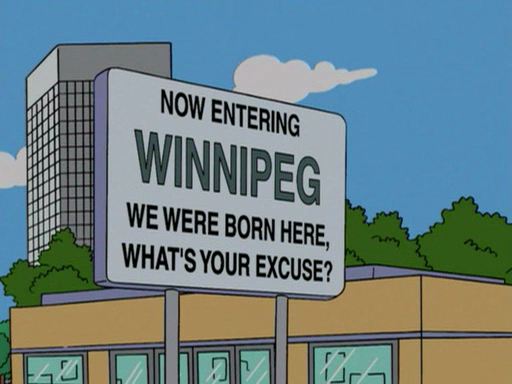 "Back to Winnipeg!". Martin wakes up and thinks he's in the great cornfields of Canada. They saw the Canadian film Naked Lunch. 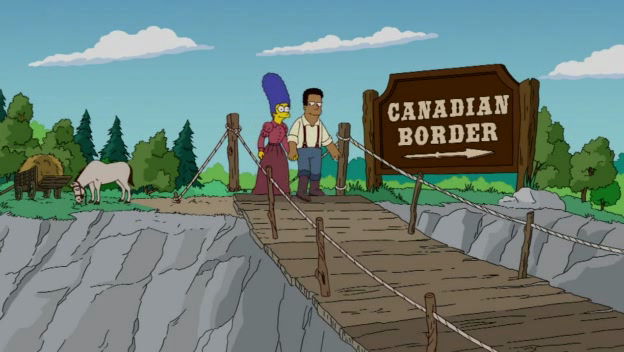 After Nelson says ''I can think of at least two things wrong with that title"
The PTA Disbands (2F19 / S06E21) - Marge (who becomes a substitute teacher) complains to Homer "It took the children 40 minutes to locate Canada on the map." 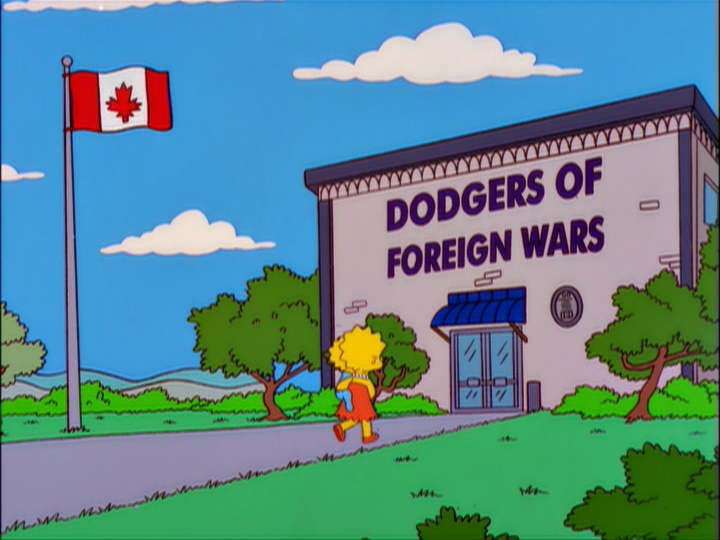 and Homer responds "Marge, anyone could miss Canada. All tucked away down there." 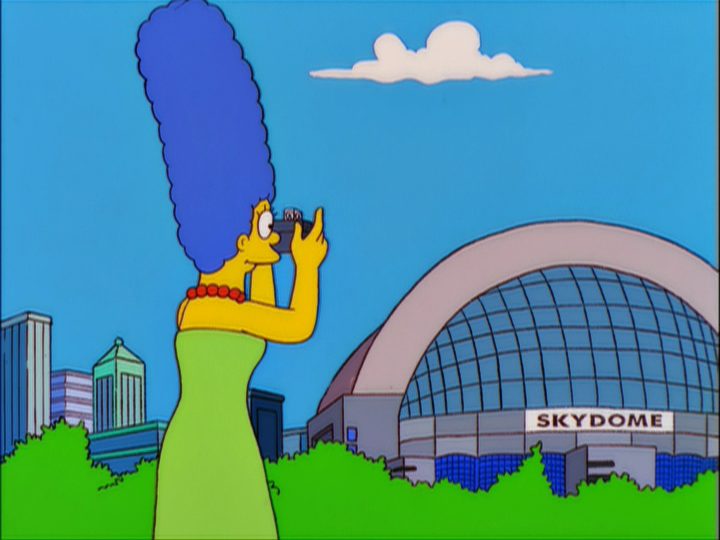 Homer's Triple Bypass (9F09 / S04E11) - Homer is sick and he is trying to reassure Marge about the operation and he says "Don't worry, Marge. 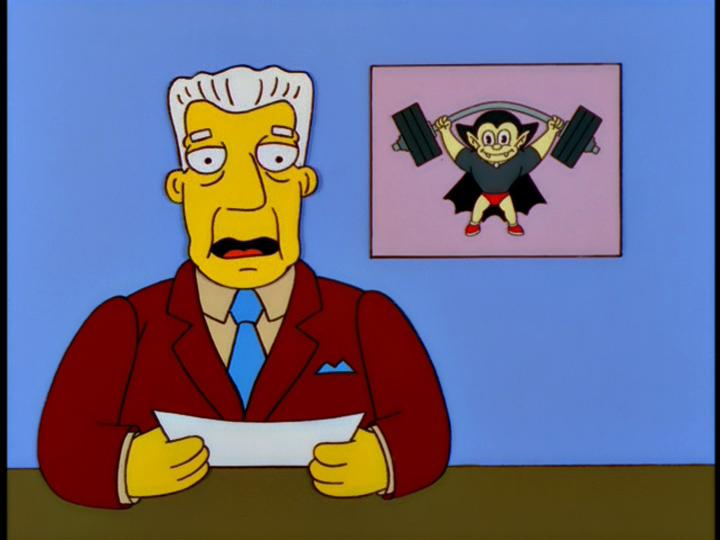 America's health care system is second only to Japan, Canada, Sweden, Great Britain, well, all of Europe, but you can thank your lucky stars we don't live in Paraguay!" 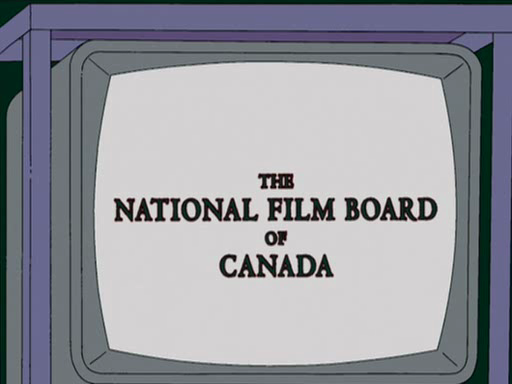 Marge Gets a Job (9F05 / S04E07) - Homer in an attempt to stall Marge he looks at his newspaper and says "Canada to hold referendum. 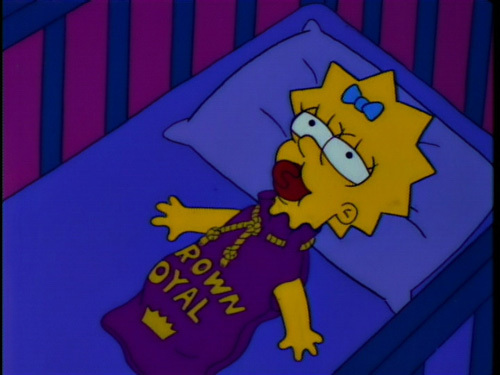 Sorry Marge can't talk now." 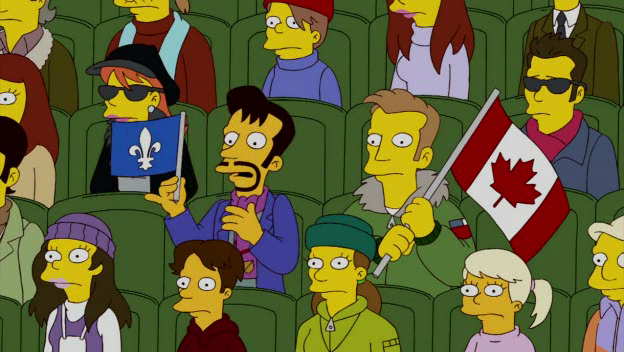 Bart's Friend Falls in Love (8F22 / S03E23) - Milhouse's girlfriend Samantha is sent to Saint Sebastian's School for Wicked Girls, which happens to be run by French Canadian Nuns. When Milhouse goes to visit her a nun says, "Samantha, ne pas de boys". 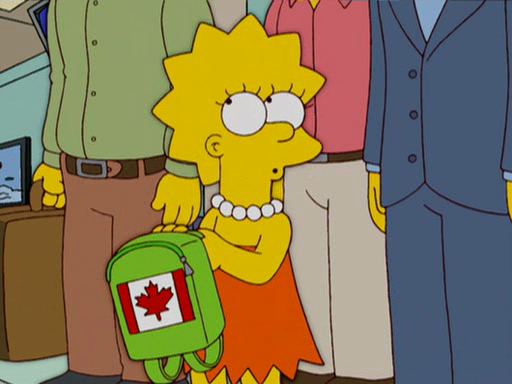 Mr. Lisa Goes to Washington (8F01 / S03E02) - The winner of the essay contest reads from his entry, "Where but in America or possibly Canada could my family find such opportunity". 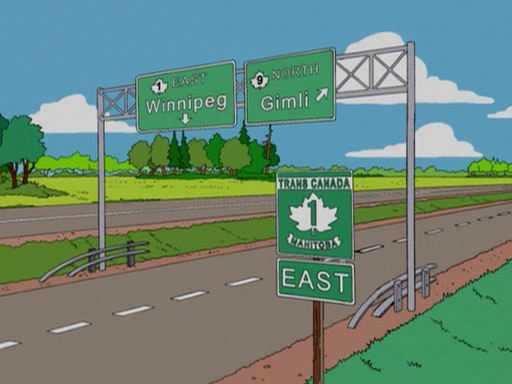 The major highway that passes through Springfield is route 401, which is the show creator Matt Groening named after the major highway which runs through Ontario. Maurice LaMarche of Futurama (Kif Kroker/Morbo/Calculon) has occasionally done voices. 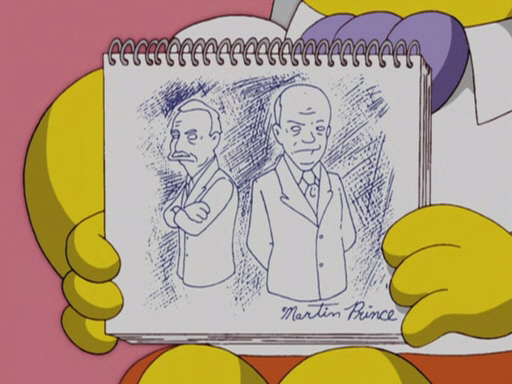 For list of references to other countries on the Simpson's check out SNPP's list The Simpsons: A Foreign Affair.